In my search for new terminology and descriptors I am no longer going to use “minimum wage” to describe the wage that a currency-issuing government should pay when implementing a Job Guarantee (JG). In the past I have written that to avoid disturbing private sector wage structure and to ensure the JG is consistent with stable inflation, the JG wage rate is best set at the minimum wage level. I have also indicated that the minimum wage should not be determined by the capacity to pay of the private sector, but should, rather be an expression of the aspiration of the society of the lowest acceptable standard of living. My view is that any private operators who cannot “afford” to pay the minimum should exit the economy. I also have proposed that the JG wage should be supplemented with a wide range of social wage expenditures, including adequate levels of public education, health, child care, and access to legal aid. Finally, I have stressed for many years that the JG does not replace conventional use of fiscal policy to achieve appropriate social and economic outcomes. In general, the JG would be accompanied by higher levels of public sector spending on public goods and infrastructure. I have written several times, in various outlets (academic, Op Ed, blog), that I see the JG as part of a fundamental transformative agenda to broaden the concept of work and to allow all people to receive a dignified and appropriate access to the distribution system. That message doesn’t seem to get through. So from now on the JG wage will be referred to as the living wage. Further, recent discussions of the JG reveal that commentators who criticise it do so from a standpoint of ignorance – a problem that is engendered by the blogosphere, which should be a liberating force, but in my view seems to unfortunately spawn narrow-mindedness and an anti-intellectual approach to policy debates. For all my JG blogs go to the articles that appear under the – Job Guarantee Category. Bear in mind that these are more specific blogs about the JG and are supported by many other articles, which outline theory, data etc. You can start to learn the macroeconomic essentials by accessing the blogs under the – Debriefing 101 Category – of my blog. These blogs, however, are just an entree into my work on the topic. The substantive literature is in the academic domain, which has been developed over many years. I decided to start a blog in 2004 to provide a more public focus for some of this literature in terms of summary points and ease of exposition. But one should not assess the concept of a JG by only considering the blogs, or a subset of them, perhaps the latest blog on the topic. I think the blog platform is a potentially liberating force in society as it breaks the hold that the publishing companies (whether they be academic or media) have on the dissemination of information and argument. However, I have observed a tendency in the blogosphere for participants (particularly commentators) to see it as a platform for the knee-jerk venting of raw prejudice. I read statements such as “Bill Mitchell wants everyone to be enslaved in a low wage job”, and comments such as that, which then leads the commentator to wax lyrical about how stupid or oppressive or part of the system I am. It is clear that these commentators haven’t read very much of my work; have never considered the nuance that you will find in it; and haven’t considered that I (and the rest of the original MMT proponents) might have anticipated and addressed all of the likely criticisms of an employment guarantee that could be raised in the long literature that we have constructed on the topic. Each new commentator – seems to think they have a privileged position to rant about our work without any knowledge of the long-history of that work. While it is clear – if you read the many articles, books etc that I have published in the academic literature – that I consider the JG to be part of a liberal and radical agenda to transform the way we use the economy to advance a very broad and egalitarian conception of public purpose, the blogosphere commentators still seem content to conduct their attacks on spurious grounds. The critics on both sides of the political divide conservative and progressive, still cannot seem to get all that. Progressives, for example, claim the JG is akin to slavery or servitude and a vehicle for defending the status quo of industrial capital. I think that the JG is difficult for Americans to understand in its complexity, in part, because the term “minimum wage” carries such stigma there, given that nation’s appalling history of minimum wage setting. So consistent with the points made in our paper – Framing Modern Monetary Theory – the use of language to frame responses to ideas that are not part of the mainstream is important. It clearly goes beyond language though. An educated debate considers all possible angles. Curiosity leads one to dig as deeply as they can into the extant literature to see where ideas have come from and to trace the “struggle” that the proponents of the ideas have had in coming to their positions. I use struggle in the intellectual sense – as the working out of ideas and the complexity of the internal debates that a researcher has as they put together what they consider to be a coherent world view based on the conceptual framework and evidence-base that they assemble. I always ask the questions – why? (does writer make a claim), how? (did they arrive at that), what? (are the nuances, qualifications, meanings, historical evolution, etc) – when I read something as I am making an assessment about whether the ideas constitute knowledge or should rather be considered statements of religious faith (ideology). There was a response to our paper – Framing Modern Monetary Theory – on Naked Capitalism over the weekend (December 8, 2013) – Modern Monetary Theory Meets George Lakoff – which attracted many comments. I don’t want to discuss each comment or any particular comment but rather reiterate my view that the JG provides a path to a liberating progressive alternative and is not akin to accepting the status quo. I consider the JG to be superior in this regard – as part of an overall progressive socio-economic strategy aimed at achieving fundamental social change away from individualism towards a caring collectivism where the economy is driven by us to deliver benefits to the planet and the people who occupy it – than the options proposed by the proponents of a basic income guarantee. I did some updating of the data covering the US minimum wage today. The US Department of Labor provides a well documented site outlining – US Minimum wage rules. The following graph shows the movement in real federal minimum wages (deflated by CPI-1) from 1968 to 2013 where I indexed the series to be 100 in 1968. It shows the – Real National Average Wage Index – provided by the US Social Security Administration over the same period (also deflated by the CPI-W series). The red line is the labour productivity per hour (indexed to 100 in 1968), which is available from the – US Bureau of Labor Statistics. Labour productivity growth provides the “space” for non-inflationary growth in nominal wages because proportional growth in both leaves unit costs unchanged. Another way of saying this is that non-inflationary real wages growth is provided for by productivity growth. There is a very detailed literature on all of this. I could have used a number of comparative wage series and the result would have been the same. Overall, real wages growth in the US has been very modest indeed and have trailed labour productivity growth by an almost unbelievable margin. The real average wage index grew by 23 per cent between 1968 and 2012 while the labour productivity index grew by 133 per cent. The gap between real wages growth and labour productivity growth broadly represents the change in distribution of national income away from wages towards profits over this period. The lot of the federal minimum wage workers, however, is even more dire. They have experienced a cut in real wages of around 30 per cent since 1968. So none of the productivity growth in the US has been to the benefit of this group. I realise there are other real income sources for low wage workers (food stamps etc) but these non-wage benefits do not go anywhere near providing for growth in real living standards for workers locked into minimum wage jobs. The US Bureau of Labour Statistics – TED: The Editor’s Desk – has estimated that “In 2012, there were 3.6 million hourly paid workers in the United States with wages at or below the federal minimum wage of $7.25 per hour. These workers made up 4.7 percent of the 75.3 million workers age 16 and over who were paid at hourly rates”. These workers were concentrated in “leisure and hospitality (about 19 percent)”. The proportion of minimum wage workers in the US is declining (the figure was close to 9 per cent in 1980 for example). The US Congressional Budget Office produced this report in 2011 – Changes in the Distribution of Workers’ Hourly Wages Between 1979 and 2009 – which analyses the shifts in the wage distribution in the US. The wage distribution in the US has become more dispersed in this period with the top 10 per cent experiencing significantly stronger growth in real hourly wages than the 50th percentile and the 10th percentile. The gap between the 50th percentile and the 10th percentile remained stable over the last 20 years. 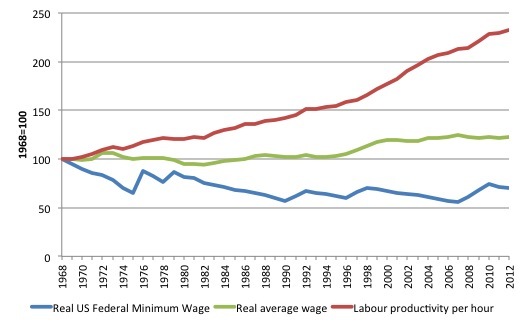 While 4.7 per cent of workers in the US received the minimum wage (as noted above), the 10th percentile only received $US8 per hour in real terms in 2009, which was equivalent to a real minimum wage (in 2009 dollars) of $US6.25. So a considerable number of workers are receiving hourly pay that is close to the federal minimum. The point of all this is that the US has a very blighted history of minimum wages growth. It is no wonder progressive thinkers consider it an outrage and jump on suggestions that a comprehensive job creation program might be based on “minimum wage jobs”. It would be reasonable to heap scorn on me if I was proposing a “progressive solution” that made the current US minimum wage the wage norm for the job creation program. And to some extent, the use of the term “minimum wage” in the JG literature by myself and others invites that sort of response. Language matters. But having said that, it is also beholden on any progressive to consider the broader context of proposals. As a minimum, the enquiry should include the literature trail that supports the proposal. If one takes the time to fully document the JG proposal they would find – as above – that I consider the current US minimum wage to be an outrage, especially when you also consider the dearth of social wage accompaniments such as the quality of health care and public education in the US. It is in that context that I am now eschewing the use of the term minimum wage in favour of living wage, which dissociates the JG proposal from current US minimum wage settings. I should note that the federal minimum wage in Australia is also outrageously low and should be increased considerably and accompanied by a fundamental review of public provision of education, health care, child care etc (in favour of more)! Using the term “living wage” forces the reader to ask further questions, such as, what is the “living wage”? How might we calculate that? Who is responsible for its maintenance and enforcement? What is the logic of such a concept? Then the reader will be forced to read the broader literature and not jump to spurious conclusions about the proposal. But I want to go further than this. Work is intrinsic to human existence. We seek to transform nature to live. Certainly, history has evolved to the stage where the organisation of that effort – Capitalism – is oppressive and the anathema of liberation, despite the wage form making it look as though we have freedom to choose. But we need to separate the specific form of work organisation from the intrinsic meaning of work for people. People will still seek ways to “work” and will have to work, even if we liberate ourselves from the specific yoke of Capitalism. Apparently, “MMT isn’t a program for social change” and “On most of the major economic challenges facing our society, MMT has no specific proposal on offer”. And further, “MMT is still contained within an existing conceptual framework that Mitchell does not yet seem to see or question”. These are representative of many comments we read about MMT around the Internet. None of those comments provides an accurate description or assessment of my work on MMT or the JG. While MMT provides an accurate description of how the capitalist monetary system operates and can support policies prescriptions consistent with either the individualistic or collective value systems, we prefer to situate this challenge within a collective vision of public purpose. A related advantage for progressives of promoting public awareness in MMT is that the ideological basis of conservative policy agendas would become more transparent. It could no longer be said that fiscal austerity needs to be imposed because the government has run out of money. It is anticipated that if the public were to have a better understanding of how the system actually works and could correctly distinguish between fiscal space constraints and ideological constraints, we would end austerity and demand policy responses that enhanced our collective and individual wellbeing. In my own writing, I have sought to separate the conceptual nature of Modern Monetary Theory (MMT) from the value system that we might overlay that conceptual structure. The combination of the two “layers” then define the “program” that one would propose. I think in my writing there is a very detailed “program” advocated that is supported in terms of macroeconomic sustainability by the MMT propositions that we have articulated. Second, I have written extensively (alone and with others) on the superiority of employment guarantees over income guarantees. Please read my blog – Employment guarantees are better than income guarantees – for more discussion on this point. But if you want a deeper, academic discussion, then we have published several peer-reviewed articles on the topic that the above blog merely summarises. It creates a dependency on passive welfare payments. It creates a stigmatised cohort. It does not provide any inflation buffer and is inconsistent with the macroeconomic principles spelt out by MMT. It does not provide any capacity building. A BIG treats people who are unable to find adequate market-based work as “consumption” entities and attempts to meet their consumption needs. However, the intrinsic social and capacity building role of participating in paid work is ignored and hence undervalued. It is sometimes said that beyond all the benefits in terms of self-esteem, social inclusion, confidence-building, skill augmentation and the like, a priceless benefit of creating full employment is that the “children see at least one parent going to work each morning”. In other words, it creates an intergenerational stimulus that the BIG approach can never create. Unlike the BIG model, the Job Guarantee model meets these conditions within the constraints of a monetary capitalist system. The JG is a far better vehicle to rebuild a sense of community and the purposeful nature of work. It is the only real alternative if intergenerational disadvantage is to be avoided. It also provides the framework whereby the concept of work itself can be broadened to include activities that many would currently dismiss as being leisure, which is consistent with the aspirations of some BIG advocates. And that takes me to the third point of today’s blog. There has been considerable research done by social scientists which suggests that people still consider work to be a central aspect of life and there are deep-seated views about deservingness and responsibility for one’s circumstances. These views translate into very firm attitudes about mutual obligation and how much support should be provided to the unemployed. These attitudes while mostly unhelpful are ingrained and will take time to shift. Further, most unemployed workers indicate in surveys that they prefer to work rather than be provided with income support. If the vast majority of workers prefer to work then the systemic failure to provide a sufficient quantum of jobs imposes harsh costs that can be alleviated by the introduction of a Job Guarantee. In this regard, the Job Guarantee is a source of freedom – the capitalist property relations notwithstanding. I accept that some people – the so-called “sea-changers” – do not value work in any intrinsic sense and if confronted with the choice between the Job Guarantee and a Basic Income would take the latter option every time. A blanket Job Guarantee is coercive in its impact on this particular group. Please read my blog – Would the Job Guarantee be coercive? – for more discussion on this point. The future of paid work is clearly an important debate. The traditional moral views about the virtues of work – which are exploited by the capitalist class – need to be recast. Clearly, social policy can play a part in engendering this debate and help establish transition dynamics. However, it is likely that a non-capitalist system of work and income generation is needed before the yoke of the work ethic and the stigmatisation of non-work is fully expunged. The question is how to make this transition in light of the constraints that capital places on the working class and the State. BI advocates think that their approach provides exactly this dynamic. Clearly, there is a need to embrace a broader concept of work in the first phase of decoupling work and income. However, to impose this new culture of non-work on to society as it currently exists is unlikely to be a constructive approach. The patent resentment of the unemployed will only be transferred to the “surfers on Malibu” (using Van Parijs’ conception of life on the Basic Income)! The Job Guarantee in fact provides a vehicle to establish a new employment paradigm where community development jobs become valued. Over time and within this new Job Guarantee employment paradigm, public debate and education can help broaden the concept of valuable work until activities which we might construe today as being “leisure” would become considered to be “gainful” employment. Further, relating to my earlier remarks – community activism could become a Job Guarantee job. For example, organising and managing a community garden to provide food for the poor could be a paid job. We would see more of that activity if it was rewarded in this way. Start to get the picture – we can re-define the concept of productive work well beyond the realms of “gainful work” which specifically related to activities that generated private profits for firms. My conception of productivity is social, shared, public … and only limited by one’s imagination. Further, at present, the private sector in some capitalist economies (notably, the English-speaking ones) has reduced unemployment but this has come at the expense of creating increasing time-related underemployment (with implied inadequacy of employment situations). It is highly likely that the introduction of the Job Guarantee will place pressure on private employers, particularly in the low-skill service sectors to restructure their workplaces to overcome the discontent that their underemployed workers feel. A full-time Job Guarantee position at wages not significantly different from the low pay in the private sector service industries would appear attractive relative to a private job that rations the worker hours. In this regard, the Job Guarantee would offer flexibility to workers. Some would prefer part-time jobs while others would require full-time jobs within the Job Guarantee. It should be obvious this flexibility can accommodate virtually any requirement of workers. Further, it is very easy to design the program in such a way that child care services will be provided by Job Guarantee workers, to accommodate parental needs. Anyway, social attitudes take time to evolve and are best reinforced by changes in the educational system. The social fabric must be rebuilt over time. The change in the mode of production through evolutionary means will not happen overnight, and concepts of community wealth and civic responsibility that have been eroded over time, by the divide and conquer individualism of the neo-liberal era, have to be restored. That seems like a very progressive view of the future than is indicated by the often-read blogosphere commentary about the JG and MMT. And I have only just touched on how the JG fits into a transformative vehicle in this blog. I have written millions of other words in other places. Is there a way of measuring productivity that doesn’t rely on the marginal assumption that firms will sack staff the instant there is a downturn? The UK hasn’t had the unemployment, but it has seen a productivity drop in the statistics. That leads to the usual doom laden prophecies of the country going backwards, when it seems to me that it is just a statistical aberration caused by firms failing to behave as the religious texts dictate. It clearly won’t be. The post WWII compact where the unemployed receive income, and those that are difficult to employ are absorbed quietly into the public sector has been ripped apart over the last thirty years. That’s because it was implicit in the design, rather than being an explicit programme with that purpose. So people that work resented those that were unemployed and got paid anyway (even though they didn’t get as much), and they resented those in the public sector on ‘cushy jobs’ (without realising that the spending from that job paid their wages). That’s why the Job Guarantee has to be explicit. And in keeping with the new ‘language matters’ I’ve started to call it a Job Alternative Guarantee (a JAG), which explains that it is a permanent *alternative* job offer available to everyone. Only with a permanent alternative job offer on the table can ‘no deal’ become an option, and a market system start to function adequately. “A community garden to provide food for the poor could be a paid job.” Completely impractical, I think. Much the simplest way to provide for the poor is simply to give them an adequate amount of CASH. Indeed that’s exactly what Bill himself proposes in the form of the living wage. So if you have special “gardens” providing food for the poor, that’s just duplication of effort. Moreover, how do those turning up at “community gardens” prove they are poor? Do they bring their last income tax return? The mind boggles at the bureaucracy. Plus how good would the relatively unskilled labour on JG schemes be at deciphering income tax returns? Indeed, would they even have the skills needed to produce disease free and presentable vegetables? I doubt it. Next, Bill says that “My view is that any private operators who cannot “afford” to pay the minimum should exit the economy.” I.e. he is saying that where a private employer cannot get customers to VOLUNTARILY part with enough cash to fund a job at the living wage, the job should be destroyed. Yet when it comes to strange selection of activities that Bill prefers (part time “musicians, artists, surfers, Thespians..”) apparently it’s OK to take money by NON-VOLUNTARY means (i.e. by force) off taxpayers so as to fund the latter. I suspect Mr and Mrs Average just won’t buy that, and I don’t blame them. What Mr and Mrs Average want is first, a certain amount of privately produced stuff, and second a number of publically produced items: state education, law enforcement, social security for the sick, the elderly and so on. If Mr & Mrs Average are told they’re going to have to support part time “liberating progressive” thespians and surfers because it’s all part of a “transformative agenda”, they’ll be laughing in the aisles. I suggest JG employees should be subsidised into work with EXISTING employers: that way they’d produce stuff in a reasonably efficient manner, because they’d be working alongside skilled experienced labour, plus they’d be producing stuff that Mr & Mrs Average want. “Thespians” is my new word of the day. Thanks! Yes. Because that private employer is skimming profit for their own benefit. In the public job the profit goes to everybody – or to the individual. No private profit unless you pay the living wage – period, end of argument. If the capitalist can’t do that, then they need to go invest some capital and find a way of doing it – or get lost. In my opinion JG would definitely have to exist alongside BI as we cant leave people to die if they do not wish to engage in any work. It would be a very harsh thing to let people live on food stamps for people like you who advocate a more harmonious society. So these people would be given a minimum “living income” just enough to cover their cost of food and clothing assuming they have access to all public services. “living income” in this case is appropriate but I think “living wage” would have a degrading meaning for JG work as it implies that it is some kind of lower grade of work, something you do just to live which would be contrary to what you want JG to mean to society. I would suggest social income or social wage. Also I am trying to imagine the start up of such JG and trying to estimate the immediate effects and reaction from people. Because when talking in concept we always imagine it as an already functioning system and it sounds fine but the first steps would have to be thought and planned. You might have already planed such an initial stage my apologies in that case as I havent read too much about JG. has the JG idea been considered seriously by any council or local government and has any forecasting ever made about its possible effects in a small scale community? I am interested in local currencies and I think using a local currency to pay JG workers and letting them use the currency in local shops and local government collecting taxes in that currency would be a good starting project. You may have missed the blogs where it is showed that taxpayers don’t fund anything. This to me looks like one of the knee-jerk comments that Bill was referring to. In a well-educated population Mr & Mrs Average would know they do not support JG workers. If anything, they would realise JG workers support them in as many ways as the JG designers can think of. As for the wage rants, if people want to get their garbage picked-up but nobody wants to do the work, you can either coerce the unemployed desperate for work to do so on a miserable wage (what we have now), or pay somebody enough so that the rewards make it interesting enough to do so. In that sense a relatively-non-coercive-JG worker will probably not chose to do that on a living wage, however, being a necessity, garbage collection would have to be done by people on more traditional (i.e. non JAG) contracts that would pay enough to make them willing to get dirty. This could be either private or public companies, it does not matter, but in the end that would bring some fairness to income (the story goes that the harder a task, the more rewarding it should be). I don’t see why this wouldn’t apply to any “dirty job”. In terms of real goods and resources this means that in aggregate, more of them would be allocated to the people who get dirty for the rest of us, because they would get more currency (resource token) than they currently do, for the same work. We may be fine with it, or we may realise that the cost is prohibitive and invest and/or change our way of life to bring the cost down. My point being that a well implemented JG could very well reveal the true costs of some activities that are currently being suppressed by the oppressing of the poor, under-employed and unemployed. When you think of it, a JG forces into The Market from the “bottom” end whatever value it upholds. I know the percentage of “sea/tree changers” is quite small, despite the opposite being the common belief. I’m equally sure that if that belief prevailed at the policy level the unemployed would be dragooned into Operation Sovereign Bludger quick smart. But they know it’s BS, and the buffer stock of unemployed currently meets all their ideological needs, plus some. Perhaps we need some angry mobs demanding those lazy unemployed rabbits be tossed into the briar patch. Most developed countries now have unemployment insurance (in Canada it is now misleadingly called Employment Insurance). If a country adopts JG, should it maintain its unemployment insurance? I would say that it should because the idea of unemployment insurance is to provide temporary income for a relatively short period in which the unemployed person can look for a new job. The biggest difficulty with JG, as I see it, is to find useful work for the participants. If 5% of the labor force ends up on JG, the people running it have to come with many tasks to be performed. That may not be so easy. In Would the Job Guarantee be coercive?, Bill summarises his point of view and mentions others’ on the subject in the opening section. In short, yes a country could maintain income support for job seekers, Bill thinks it shouldn’t others think it should. But nothing prevents a society from running both schemes (income support and JG) in parallel. Also, Bill has acknowledged in various blogs that JG could potentially be stigmatising as well, but less so than simple unemployment. In the broader framework, if the JG wage is at the right level, aggregate demand should never be deficient, therefore there should be plenty of opportunities for private profit. This and the “stigmatising” factor would help people move away from JG into non-JG employment, if only for profit-seeking. You say that it is hard to find “useful” work for the participants, but you do not define what “useful” means. And it seems the free market decided a while ago that all speculation is useful, which I’m sure you would contest. JG would define “useful” as being whatever the JG designers/organisers (i.e. the delegates of the community in a democratic society) decice a JG worker is supposed to do. It is – but like all small groups they are the most vocal and the most active. And they tend to be the lynch pins in progressive organisations and political groupings – which is why you can never get anywhere sensible with them. This belief that they have a right to income (and therefore output) and nobody should be able to tell them what to do is quite amazing. It’s borderline delusional. It’s just like Proportional Representation. They were all amazed when people voted against it in a referendum. The number of unemployed people wandering around like lost souls should tell us that the most important thing we need to build is something constructive for them to do with their time. That very much depends on the politics and maturity of the society in general. I can imagine the US (for example) being quite keen on people dying if they don’t take a job. They already kill people that commit crimes, have overly liberal gun laws and allow people to die through lack of medical care. Ok I agree with you. But the solutions to this problem need not be progressive. In the conservative catholic Ireland of the pre euro era the women remained at home. Today they capture a mans fiat savings and leave to find another willing victim…. What defines ‘useful’ is what is considered ‘useful’ by your peers. It is them you have to convince, and therefore a correctly designed JG will have to be politically sensitive to that usefulness. That’s much more mature than the BIG idea that everybody is just going to have to accept people who choose not to work – which is never going to happen on any council estate I’m aware of. Because your peers define what is ‘useful’, then the type of work on the JG will (IMV) be determined by the social maturity of the society in which the JG is instigated. The JG designers just channel the expectations of society – and will need to do that if the programme is to be a success. the norm) a job guarentee paying a living wage would mean a truly enormous fiscal stimulus. employers to chose McDonald’s over working on a communal garden. promising.Then of course is the largely untapped potential of poor people to save! I certainly think all people wanting to work should be able to and the government can guarentee jobs for all. employing high skilled high wage work addressing investment and achievements in these fields . We do not need to spend our waking hours toiling the land to survive. An economy that serves the people can establish a life work balance. So you want to destroy private sector jobs where Mr & Mrs Average are prepared to cover 90% or 80% of costs rather than the 100% that would make the job viable, and replace that with jobs which Mr & Mrs Average regard as a joke (part time thespians and surfers). In effect you’re trying to do just about everything possible to reduce GDP. Standard measures of GDP are based on the market price of goods and services and the latter is determined by what the customer is prepared to pay. I’m in favour of that: I’m in favour of Mr and Mrs Average determining the value on stuff rather than economists with strange ideas about the value of part time thespians and surfers having the whip hand. Giving Mr & Mrs A the whip hand is called “democracy” or “consumer sovereignty”. Moreover, in all the political debate on TV and in newspapers I’ve seen, I’ve never noticed a big demand for part time thespians, surfers, poets, daisy chain makers, amateur gardeners, etc etc. Seems to me what people want is the bog standard stuff: better housing, cheaper fuel for heating same, a better health service, law enforcement, etc etc. Next, you claim that “In a well-educated population Mr & Mrs Average would know they do not support JG workers. If anything, they would realise JG workers support them in as many ways as the JG designers can think of.” On the contrary, I think even a well educated Mr & Mrs Average would fall about laughing at the idea that they’re being supported by part time surfers and thespians. And I’d agree with Mr and Mrs Average and for reasons given in my response to Neil just above. I’ve heard this before. And it’s complete fairy dust. The consumer doesn’t support the full cost of electrifying automobiles, but it is nevertheless something that needs to be done. The price mechanism and education alone are not going to get us there. Better scientists and economists being the true steering wheel of the market rather than those in advertising, marketing, consumer psychology and politics that we have now. I can’t see any way that Mr and Mrs Average could ever be informed enough to give them supremacy over the natural environment. We really are just a bunch of talking monkeys. I want to trim the finance sector down to about a tenth of its current size as well. That will definitely cut GDP. But it’s all the wrong sort of GDP, so that doesn’t matter. Except to those people obsessed with GDP. Huge parts of the private sector include non-jobs. Pretty much all of finance. Most of accounting and legal, and definitely anything to do with PR, marketing or advertising. All of those jobs are completely pointless in any sensible distribution system that doesn’t rely on monetary accumulation. So the private sector is stuffed full of non-jobs, and there will need to be even more of them as productivity improves. Remember there is *no need* for the private sector at all. It makes little sense in equitable distribution to have people accumulating vast wealth for themselves. It is only allowed a part in this play because it can come up with smarter way to get things done by employing capital devices – which makes us all better off because we can get more done with less. It can be efficient, but not necessarily effective. And therefore the only time that a capitalist should get a chocolate drop is when they do what we need them to do – invest capital and get more done with less (including less people). They should not get a chocolate drop when they employ any other nefarious techniques to try and do more with less – including cutting wages to the bare bones and using up labour that can be deployed elsewhere. So I go to a much more fundamental level in my analysis than you do. Why on earth do we allow these capitalists any time at all on the park? What is the point of their existence? And I conclude that the system works best when they are contained and required to exploit capital. When they are forced to invest in machinery and forced to invest in training opportunities. In other words when the capitalists are forced to bridge the investment gap to labour if they want the profit for themselves. And if they refuse they get nothing, and life carries on without them. The “shoe-shine boys” remark might have been based on my comments at Naked Capitalism. My comment wasn’t directed at Bill’s proposals. As he says, he has always proposed the JG as part of a more comprehensive vision of social change, and has insisted on the need for for other uses of fiscal policy to achieve a more equal society. But the JG proposal has sometimes been presented by others in much less liberating and progressive ways. I was responding to another commenter at Naked Capitalism, and trying to point out that the mere fact that a society might provide jobs for all its citizens is not sufficient in itself to challenge plutocracy or achieve real social progress. Those government jobs must be embedded in government spending programs and priorities that are pointing the country in the right direction. I also find it necessary sometimes to challenge commenters who sometimes see MMT as a comprehensive social program and universal panacea deriving from the discovery of a magical money machine, the embrace of which is itself sufficient to guarantee social progress and is thus a fully adequate foundation for social and political activism. But an understanding of MMT can be coupled with a wide variety of social agendas, some very bold and progressive, some relatively conservative; some calling for a large state role, some for a relatively modest one. I don’t know about other countries, but here in the US we have things falling apart all over the country, and many people live in deplorable, miserable conditions. And we have barely begun the task of retooling our transportation, energy, housing and educational systems to adapt to the demands of the 21st century. So the idea that we are somehow out of work to do and are doomed to a robot economy with millions of people either on the dole or doing useless make-work jobs is ludicrous. I don’t see how this statement can be doubted. MMT makes an important contribution to social and economic thinking, and is an important piece of the puzzle. But if you make a list of all of the challenges facing our society and our planet in 2013 that possess an important economic dimension, and then ask for any given item X on the list, “What is the MMT proposal regarding X?”, in most cases the answer will have to be “There is none.” That is not a criticism of MMT. It is a consequence of the inherent limits of macroeconomics. There is no specific MMT answer to the question of how we should organize the education of our children; which forms of energy we should invest in; how we should re-organize our transportation systems; how we should organize our health care system; how we should structure national and global defense systems; how we should structure our retirement systems, etc. These are huge choices societies have to make about the allocation of their material and human resources, and so are questions about our economic challenges. But they lie outside the scope of macroeconomic theory alone. which jobs will go under the normal public employment, and which under the JG? and if JG jobs are useful to the community, why should they earn less than the others? As this is something of an overview, I’d like to drop a concept from “outside” into the JG debate. There are control actions, which address continuity and sustainability. There are corrective actions, whose sole focus is the shortest path back to control. An action can’t logically be both; which is the JG? On the subject of the guaranteed income, while I admit to being something of a proponent, I personally cant see its benefit unless it is adopted globally, which means the weekly amount would need to start out PAINFULLY low (as much as “slave labour” needs to be addressed, eradication overnight would be a VERY Unhealthy shock to the system), probably in the order of $3 – $10 US per adult would be enough for currency issuers to not feel too large of an inflationary burden (though i imagine the poorest countries might need to be watched very closely) whilst alleviating those in the absolute worst deprivation with a form of mere survival that doesn’t deter them from working at a reasonable job for a more reasonable level of compensation than desperation would otherwise cause them to accept. I don’t see how this could be a terrible idea unless I’ve missed something? I would really like to know what negative implications something like a global income scheme providing nothing more than absolute base level existence might have. I see possible overpopulation as a potential problem but there’s countless ways of dealing with that other than culling the very poorest through that kind of poverty. If you ban free banking I assume you will need a very large issuance of demand notes to eat the surplus newly created…….no inflation that I can see……no assets will be available to inflate other then perhaps Gold …..give the housing assets back to the people etc etc. People really want wine women and song……not cars built in the core. Its as simple as that really. If there is money in the village people will follow the money back to the village. We are now living in a artificial Environment. Corporate forces have prevented the production of money which will flow back to the village and destroy their Industrial model. Hardy Kruger : tell me what did you do before you entered the field of civic administration ? Anthony Quinn : Oh I was a wine seller sir …. Hardy Kruger : and whom did you sell your wine. The decline of table wine consumption has been dramatic in France and Italy post war and certainly since the deflation post 1980. All so to pay for cars and the black liquid which goes into it. The 1979 /80 event was a crisis of German capital and the financial capitals which have backed it over generations. If you travel much in Europe the most striking aspect is the decline of the village and market town – all a result of the centrifugal force of interest bearing money. Consider the case where many workers in a depressed area become redundant in an unprofitable declining industry. Suppose also that here are no vacancies for alternative jobs in this area. A. The redundant workers are given a “living wage” +fringe benefits in JG jobs in the depressed area (“employed” as community gardeners, thespians etc). It seems that Prof. Mitchell is advocating this option. B. The redundant workers are offered JG jobs + housing etc. in distant areas with better economic prospects. It seems that this is not the option advocated by Prof. Mitchell because he does not mention housing and relocation costs – he merely says “the JG wage should be supplemented with a wide range of social wage expenditures, including adequate levels of public education, health, child care, and access to legal aid.” If new housing etc. is added the costs of a JG scheme would be much higher. C. The Keynesian market option (national aggregate demand management generating productive job opportunities, with free choice and market incentives for workers). Aggregate demand boost creates new productive and profitable jobs nationally. Redundant workers in a depressed area can then choose to relocate to less depressed areas/industries. Those who prefer to remain unemployed in a depressed area merely receive basic income support/ unemployment pay. Note that JG option A is incompatible with Keynesian Option C because the security and “living wage” + other benefits of a JG scheme in a depressed area could substantially reduce the incentives for relocation of redundant workers. Possibly local labour availability may influence the relocation of new enterprises into depressed areas, but it is unclear whether JG employees would be more attractive than any other types of redundant workers. JG employees might even be less attractive because they would expect the “living wage” + other fringe benefits +/or the easy/pleasant/unskilled work of a JG scheme rather than profitable commercial jobs. I doubt very much if inflation would be an issue. I cannot think of an economy that is anywhere close to real output capacity? Perhaps there is, I just don’t know of any, and therefore inflation is for all practical purposes a non issue. If all nations adopted the JR or a GI then the people would become wealthier (in terms of net financial assets) overnight (so to speak) which would likely cause the desire for imported goods and that might lead to foreign currency reserve issues? After all those nations would have to find a way to accumulate the required foreign currencies to meet the preferences of the domestic economy. I’m sure there are others much more astute than myself than can comment on this. I quite agree that the finance sector needs trimming. As Mervy King pointed out in his “Bagehot to Basel” speech, bank assets and liabilities in the UK are now TEN TIMES what they were relative to GDP prior to 1970. Much the same in the US. However I don’t agree that finance is the “wrong type of GDP”. I’m not even sure what the latter phrase means. That is, if people SERIOUSLY want the services of banks, and banks are viable and don’t break any laws, I don’t have a problem with that, however ridiculous you might think some of the services provided by banks are. The big problem is that the banking industry is heavily subsidised: it’s just not viable. And the people with the best ideas on how to cut it down to size where it pays for itself are in my view Lawrence Kotlikoff, Positive Money, Richard Werner, & Co.
“So I go to a much more fundamental level in my analysis than you do.” True: you are questioning the whole rationale of a free market economy. I’m all in favour of questioning the conventional wisdom, but I suggest that sort fundamental questioning of the free market shouldn’t be dragged into discussions about JG. I.e. if you want to produce some new theory about how resources should be allocated which is far removed from conventional free market ideas, that’s fine by me. But about 90% of the population, economists included, are happy with free markets, warts and all. That is, they can’t see a better way of allocating resources. Put another way, they’re happy with a system which is basically free market, but with government intervening in the free market where there is popular demand for that (e.g. so as to supply free education for kids, law enforcement, etc etc). That’s because both you and they can’t think outside the box and are stuck in a world of religious belief. Seeing any sort free market in any structure that includes real human beings is the ultimate example of the emperor’s new clothes. The market is there to provide people with what they want. When it starts selling £5 worth of polo shirt for £35 by using clever psychological association and manipulation techniques, then it is time to bring the thing under tighter control. Because it is then no longer efficient and no longer generating the optimal level of real output and distribution. We don’t need free markets any more than we need free nuclear reactors. And for the same reason. So you think, Mr & Mrs Average would rather subsidise some capitalist’s profit-seeking activity than some work with a less direct impact on productivity/GDP? And even if JG would restrict the type of companies eligible for JG worker placements, then how is it any different than just deploying the JG workers to do just these things but without giving a chocolate drop (to re-use Neil’s term) to a capitalist along the way? In any case, as implementation details, in the broader MMT framework, I think there would not be a direct link between Mr & Mrs Average’s income coming from their work and the JG wage. Indeed, I would like to think that payroll tax would be abolished altogether, since, as a society, we would want to encourage people into work (I would personally prefer a land value tax as the only form of taxation, but I digress). Without this direct “funding” link, I reckon Mr & Mrs Average would be far less reluctant to JG. For me it’s more that Mr & Mrs Average could believe that they should get something for less than it costs to produce. I’d like a Ferrari for the 40p I have in my pocket. I won’t get it for that because that doesn’t cover the cost of production. Part of market signalling in a *fair* market is that those who bid *too low* are disappointed. I come here for Delusional Therapy. Some of the commentary is really surreal. It would also be amusing, except I believe that the commentators really and truly believe. MMT is a nice klutz. It may work in theory, but would it work in practice? Doubtful – but that’s no hindrance. And as for some form of guaranteed personal income. Why does anyone need an income anyhows? Can’t they just go and grow their own, build their own, hunt their own, and we can dispense with all this money/income malarkey. Does it matter how that income arrives? Apparently it does. Does it matter what folk might ‘spend’ their incomes on? It sure does. Autarchy anyone? Here’s one some of you might think about. Central Europe: population ??? mills. How do they feed themselves? “A productive workforce is a well fed workforce.” I don’t believe there is sufficient arable and grazing land (within the aforesaid geographical area – and within walking distance), to do this. So how is it to be done? Emit fiat food? Soylent Green? If’n you’re stuck for an answer have a gander at what J. Maynard Keynes had to say on the matter. He also took a significant swipe at the contemporary currencies and their issuers. Hint: its 1919. History rhymes as they say. Bye-the bye. Anyone got any info on how Mars Bars (the Imperial sort) were use to measure the rate of money inflation? a percent of us humans from the opportunity to participate in that economy is barbaric—with the operative phrase being “the opportunity to participate”. Mankind has been, up until recently, riddled with religious beliefs that are complete fairy dust, and entire societies and economic systems have been developed around the mindset that this fairy dust has created. What’s so unrealistic about taking a step back and working from pure logic and empathy, and leave the religious ideology about private property, submission to pointless or dangerous employment for the sake of having a job behind us? It may be some decades before there are only a handful of undesirable jobs left to be done by human beings, but it certainly doesn’t hurt to look at how we deal with all of this, and MMT is the only immediate solution which actively works towards a better version of that inevitable future, rather than draconian systems in place now, and the pie-in-the-sky stuff the futurists like TVP and TZM are talking about (though they may prove quite useful in ~30 years). whether the terms job guarantee, living wage, minimum wage, basic income guarantee, universal pension, citizens dividend, national service or others are used, they will have to be explained and defended against sustained neo-liberal attack. There is no royal or linguistic road to ideological victory. For what it’s worth, my guess is “Job Guarantee” and “Living Wage” are indeed the best choices. Now at the risk of sounding like one of those I-dont-have-any-knowledge-of-your-long-term-work people (guilty), on the question of how a living wage is defined, has it been suggested that it should be linked directly to housing costs? For example, a minimum housing standard could be defined, eg 50m2 per person including utilities and reasonable access to transport and services, and the cost of this set at one third of the minimum or living wage. No doubt a non-profit Commonwealth Housing Corporation and a range of affordable housing policies would be necessary to furnish such a supply of affordable housing. It’s definitely not just housing (which u would suggest includes water & septic). It’s also nourishment, energy, transport, communication and health care that are now also required for modern dignity and social mobility. Those prices might certainly affect each other, but are certainly independent, and a close watch on all of the above would make greater sense. That being said, i think its about time there was a decent discussion about job guarantee, guaranteed basic income and welfare (including youth allowance, disability pension, parenting payments and the aged pension) and how this socio-economic group of concepts could be made as effective AND efficient as possible. I’ve yet to hear a complete vision from anyone, really. Would you still have become a professor if the government had offered you a living wage just to be a surfer? Last I checked, Bill was only paid to be a professor. Since I see no ads on this blog, one can only deduce that Bill freely spends MUCH his time writing a free blog to help educate those who have not paid for it, so at the VERY least, Bill is probably the wrong person to ask, Aidan. It is perfectly possible that the people offering and accepting work in the black market would still come out ahead because, once again, it is untaxed and unregulated. And even if this were not the case, it is certainly possible that someone wants or needs more than what a JG offers and is willing to work some extra hours for extra cash. I would rather see that person and their employer stay within the legitimate economy. Like most people I would prefer a wage above the living wage (supplemented by a social wage). Like most people I prefer to have more discretion about the trajectory of my working life. I also had the advantage of a welfare state (in Australia) which helped young people from my socio-economic background to remain at school if they were academically inclined and then to access university education with public support. My parents also had the advantage of full employment being maintained by appropriate fiscal policy. That sort of public support has been withdrawn to young people in this neo-liberal era and the national government clearly has abandoned full employment, which has dramatically altered the possibilities available to young people of limited circumstance. Further, earlier on in my life (as a young adult), I took advantage of the implicit employment guarantee offered by the public sector when I did not have sufficient funds to pay my way. I often used to get work at the Spencer Street Railyards (Melbourne, Victoria) which provided “minimum pay” jobs to anyone who turned up at the timekeeper’s office at the appropriate time on any day of the week. This was a period of full employment and a variety of people used to access work at the yards. Once they received a start card (number) they remained on the payroll as long as they kept turning up. Some used that as permanent work; others took advantage of the public railways structure and undertook in-house training to move up the pay structure into more clearly identified careers; and others, like me, used the opportunity to cross subsidise other ventures (study, music etc) and were never going to remain in the jobs on any permanent basis. But it was the capacity for employment that was always there and that was invaluable and many took advantage of that for whatever reasons that applied to their own lives. The most disadvantaged workers could always get work. The rail yards were just one example in that era of public sector job availability on a more or less continuous basis. That was characteristic of the post-war settlement – the public sector took on people that couldn’t or didn’t want to get work elsewhere. Unfortunately it was an implicit Job Guarantee by the public sector, rather than an explicit one, which was then cleverly characterised as ‘waste’ by the neo-cons.